Looking for a way to use up your leftover turkey from Thanksgiving? This is one of our family favorites. 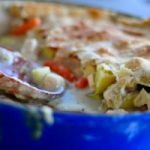 I usually make this with chicken (originally posted a few years ago as “Oh-My Chicken Pot Pie”), but also love it after Thanksgiving, when you just can’t eat one. more. turkey. sandwich. Store bought crust? Nah. Just throw together a batch of this crust. Your family will think they’ve died and gone to Pot Pie Heaven. Place potatoes, carrots, and chopped onion in a large pan. Cover with chicken broth. Heat to boil, cover and cook just until vegetables are tender, about 5-7 minutes. Using another pan, cook butter over medium heat. Add flour, whisk until smooth. When vegetables are cooked, remove vegetables from pan using slotted spoon and place cooked vegetables, fresh green beans or peas and chopped chicken (or turkey) in a greased 9x13 pan. Slowly add the chicken broth to the pan with butter and flour. Cook until sauce is thickened, and smooth. Whisk in chicken stock concentrate. Add one to two additional cups of water, a little at a time, until gravy is still slightly thickened, about the consistency of a cream soup. Add 2 teaspoons dried tarragon, salt and pepper to taste. Pour gravy over vegetables and chicken in 9x13 pan. Cover with pie crust. Cut slits in crust to allow steam to escape. Bake at 400 for 40 minutes. -*Stock concentrate is sold in many forms. It enhances the flavor of the gravy. Knorr and Swanson both sell stock concentrate. Knorr is sold in a little "cup" about 4 cups to a package the little cups are equal to about 1 tablespoon of flavoring. Swanson sells their product "Flavor Boost" in a box with 8 liquid packets included. You can also buy stock concentrate in jars at Costco or other food specialty stores. These are usually sold in 2 cup (actual 2 cup measurement) jars that need to be refrigerated after opening. I always look for products that are MSG free. A crumbled bullion cube will also work.-Brush top of crust with beaten egg for a glossy crust.-I usually set the pan on top of a cookie sheet to catch any gravy that may bubble over the pan.-This recipe yields 2- 9" pie plates or one 9x13 pan. If you like LOTS of sauce, double the gravy, and serve the extra sauce/gravy on the side with the pie.